First, apologies to chaiselongue, who finds bee pictures sort of squicky. To ease into this post, then, two pictures which have nothing to do with bees! Well, nearly nothing. The first is my Saturday harvest. Four kinds of snow peas, the last of the broccoli, and some shelling peas, which are so covered with powdery mildew it's time to pull the plants. This morning, I almost didn't notice my guest. Early to rise isn't just for people, I suppose. It's been rainy, just the perfect kind of rainy, and everything is full of beauty. Now, on to the bees. Ribbit asked where one would find a swarm. Before I became a beekeeper, I saw exactly one swarm in my life, and that just because I happened to look up at the right time into a tree in a park. I thought it was interesting, but it didn't change my life in any way. Well, the next one was the original swarm I hived, so it did change my life. Now that I'm sort of more desperate for bees, there are also many more beekeepers, and the competition is heaing up. Seriously. So I post on Craigslist, but there's a local guy who offers to pay for the swarms, and he gets most of the calls. 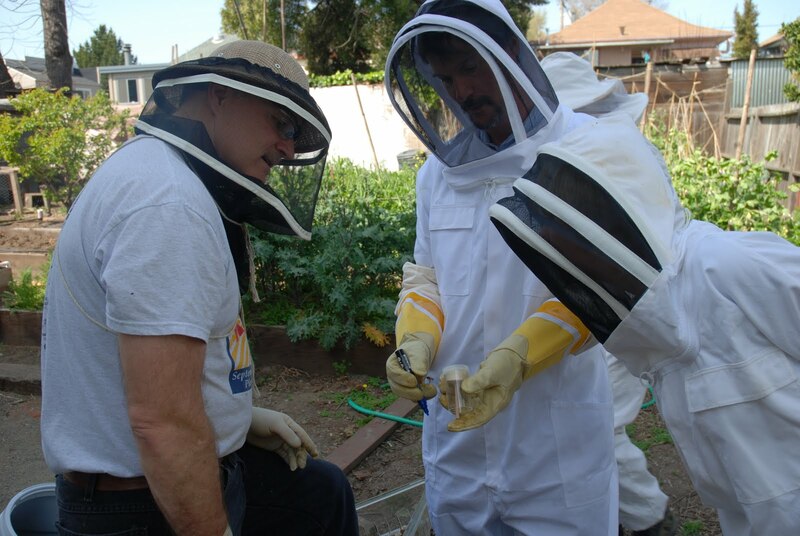 The beekeeping club has a swarm pick up list, and members of the public can call us directly. I turned down a couple of calls from this list last week. (Even though I'm anxious for bees, I'm not driving to East Oakland in the evening.) I'm on the local police department's swarm call list, and the local local beekeeper's Yahoo group and sometimes a friend will call. Lots of ways. On Saturay, there was a post on the local group that a guy had a swarming hive. So I headed out there, after making sure of the address once I realized I had it wrong, and it turned out that there were actually two swarms. So, I got one and he got one, in a sort of synchronized dance of beekeeping. They were low down in a peach tree and on an adjacent fence. We boxed the bees, the gathered up any remaining ones, and then set the boxes aside to rest. We figured that the bees would find their way there if the smells were right. During that operation, his wife came out to tell us his friends had called -- their hive was swarming. So we packed up and caravaned over there, and I helped him do a bucket catch. 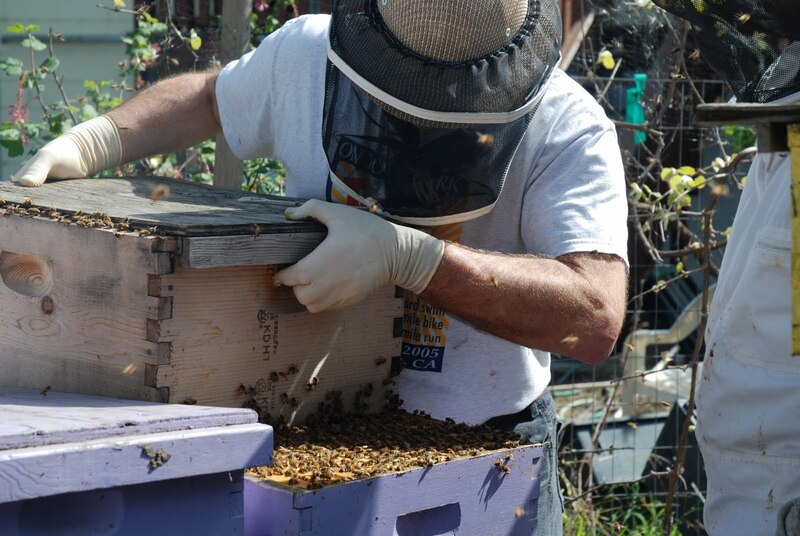 You tape a 5 gallon bucket to a stick or pole, then maneuver it under the swarm, punch up and the bulk of the bees falls into the bucket, and you pour them into a box. He was much taller than me, and could easily reach them if he stood on a table, since they were about 15' up. That one took very little time, once we got all set up. Last Friday, though, my neighbor said that my bees had been swarming. I looked out back but saw no difference in the hives. Maybe they were my bees, maybe not. There is still that feral hive, and I know of at least one beekeeper across the way. Lots of possible sources. But then -- then the swarm materialized in front of my neighbor's house, flying in a soaring vortex of humming bees. It was glorious, and we reveled in it, but I also thought, "Time to act!" So I put together a waxed cardboard box, called a Nuc Box, which holds five deep frames. I included some stinky old brood comb, figuring it would be tempting to any passing scout bees. We popped it up in a tree, and waited. Nothing. They ignored it and settled just downwind from it, in a majestic oak tree. High in the oak tree. Undaunted, another sweet neighbor tried to help me (even though he's not thrilled about bees) by setting up a 12' ladder, tying a bucket to a very long pole, and trying to "dump" the bees into it from the bottom. No go. Then he made a hook on a pole, and tried to shake them off their branch. No go; the tree was too dense. Once up there, I found I could sit on the tree, put the box under the swarm, and just sort of push them in there. They fell right in, I traded places with the box, eased the top on, and left it up there. There were some really beautiful bees in that swarm. Probably not pure bred, but there were definitely Cordovan traits. Blondes! They weren't from my yard. On Sunday, Eric got up early with me and I went back up the tree, taped a cover on the entrance hole in the box, and walked them back down the tree. They were great. I set them up in the yard. Following that, we stopped by the other beekeeper's house and picked up the swarm in the box. Two new swarms! I thought I was doing great and would have my three hives plus one to replace a friend's dead hive. Of course, as you saw yesterday, I was wrong. No new queen in my big hive called for drastic measures. Another beekeeper came over and she helped me go through that big hive and use newspaper to combine it with the pretty girl swarm. 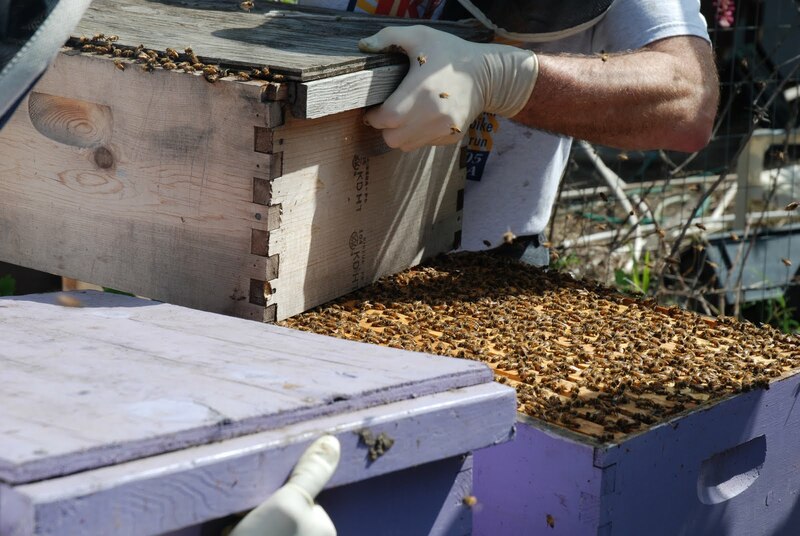 We checked the big hive, and then placed newspaper on top of the bottom brood box. Then we put a new empty box on that, transferred the swarm's frames from the cardboard box into it, filled it with more frames, and then covered that with newspaper. Kind of a sandwich, because there were more boxes to return to the top. The bees that were already in the queenless hive were pretty unpleasant to work with. They just aren't right, and they let you know. We shook them into the bottom of the hive before doing the combination. Now, this could work perfectly. I could have the new queen accepted, get my gigantic hive set up, and then (finally) get to split it into two hives.That done, I'd be finished swarm catching unless I could find some for my friends. Or the bees could kill the queen and continue on their merry, unhappy way. I'll be able to tell in a week or so. Plus I very much want to cut that hive down -- it's too tall. I dont' know if the dead bees in the front were injured in the moving around, or if they're dead from infighting. I really won't know for a bit. The really fascinating thing happened yesterday and today, though. I thought I saw bees leaving the hive carrying newspaper like little Labradors. I knew there were bits of newspaper in front of the hive (the little green bits) but wasn't sure I was seeing the movement correctly. So I went out this morning with a camera. Voila! She had to work really hard to achieve liftoff with such a big piece. It was really impressive to me, and fun to watch. I can only hope that removing the paper means all is well. I'd love a hive full of blondes. Apologies to anyone who'd rather see tomatoes transplanted and tat soi ripening seeds. It's bee season here. Everyone who thought killing a drone-laying queen was harsh will probably find this post, if not reassuring, then at least explanatory. Notice anything strange? Look closely. There are about two or three small bees, but the rest are really big-eyed and round-bottomed. They're drones. Lots of drones. Nothing but drones, and at the top, under the "finger" of comb, is a peanut-shaped cell. This hive has raised at least one queen. . . then I went deeper into it. Drones, drones, drones. This is natural comb falling off of the frame because I was holding it sideways and it wasn't attached firmly at the bottom. I can only count nine there, but there were eleven hatched-out cells. Either this hive raised a queen and she was insufficiently mated and therefore is laying only drones, or the queen didn't make it and a worker is laying. This means the death of the colony. Drones don't draw comb, and they don't do any inside work. Any foragers are just feeding them (and there were stores of nectar and pollen) but it can't last. Fortunately, it's swarm season. I think a complete shake-up is in order. I'll bring a swarm over, after the queen has proven that she can lay, and take every frame of this hive and shake it onto the ground. If there's a laying worker, she probably will be too heavy to fly back into the hive. If there's a queen, I want a new queen in her place, should she return. Then I'll take the new swarm and put it in the top hive body box, with a piece of newspaper between the two boxes. By the time the bees chew through the paper, the new queen's smell will have permeated the hive and all should be well. One thing this relatively new beekeeper has discovered, you just never know what you're going to find when you crack open a hive. 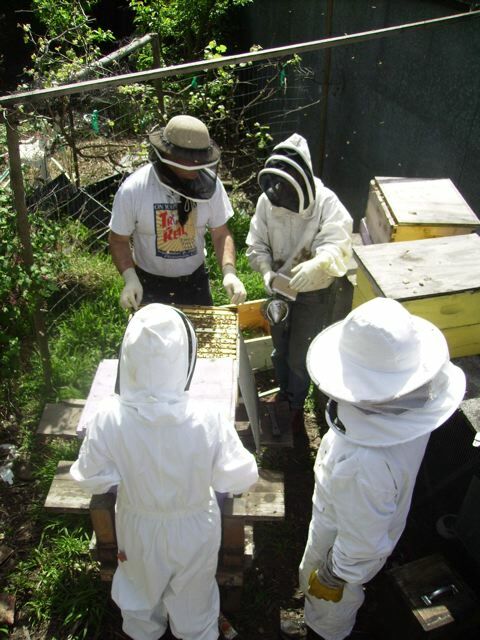 Last Tuesday, a group of beekeepers came over to see what was going on in that hive we were trying to increase. A neighbor said we all looked like hazmat folks. I found out that when there's heavy lifting going on, it's good to have a number of spare hands. Yet it was drone comb, that is, cells which are much larger than those intended for worker bees. On pre-formed foundation, the bees can draw it, but not as easily as if they have their own way completely. They did here. What did that mean? Well, it may mean that if there is a queen in this hive (and believe me, we all looked very very carefully), she's failing, but slowly, as there weren't any supersedure queen cells which the hive generally does when a queen is aging. There weren't any swarm cells, either, leaving the possibility open that the week before we'd hurt or killed the queen. 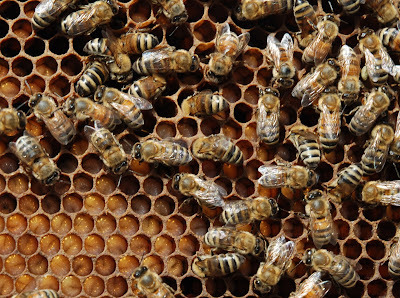 One beekeeper says no, there just wasn't enough brood even then -- she was failing. So who knows? But what do you do when the hive you thought you were going to harvest queens from ends up needing a queen? Yipes. Fortunately, the next door hive, the hived swarm from my friend's bush, had some small baby bees. Click on the picture to make bigger and you can see the curled-up, C-shaped larvae. They look like fat white grubs or sausages. These are too big to make good queens, but around the edges of a couple of frames, we found very small ones, about 1/16th of an inch long, floating in royal jelly. Those are the ones we're hoping will get crowned. Above, you can also see a very shiny cell with nectar in it, for the worker bees to use as they're caring for the larvae. When we had done all we could do, introducing the new frame of babies and hoping for queen(s), it was time to sliiiiiddee the box closed, slowly, sliding the bees out of the way. That box was heavy, so I was pleased to have someone else doing the work. Notice the bare arms? Even with a truly pissy hive, and this hive was very unhappy, as queenlessness will do that to you, there were three stings total all day. Two on the bare arms, to be honest. I was going to work bare-handed, but decided not to fairly early on. The day wasn't a complete loss (well, any day with a lot of friendly beekeepers getting together can't be bad) as Alan brought over a queen bee who was a drone layer, and therefore was doomed. We practiced picking up a queen (and I kept dropping her, of course, because that's apparently what I do) and marking her. Then, with no ado, Alan killed her. Cross fingers for better days ahead. P.S. It's my birthday, and I'd love a comment in its honor. Thank you! 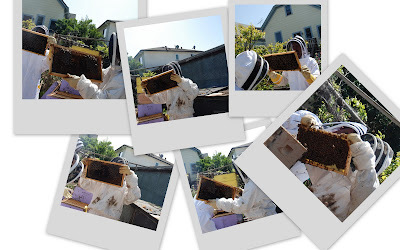 Daphne's and Kate's comments reminded me that not everyone came from my other blog, where I chronicled getting the bees, hiving them the first time, the first harvest, etc. And for vocabulary purposes, this is a screened bottom box. It allows varroa mites to fall out of the hive, and provides for good ventilation. The bees keep plenty warm, and airflow is a plus for hive health. One end is open, so the bees come and go through that into the deep hive body. The bottom boxes are about 9" tall, and they are called, appropriately enough, "deeps." Inside each are ten frames of plastic foundation in a wooden frame, running front to back. They hang down like file folders, and the bees draw out comb on the foundation and move within the hive. The babies are raised in the bottom part, in a roughly ball-shaped nest. 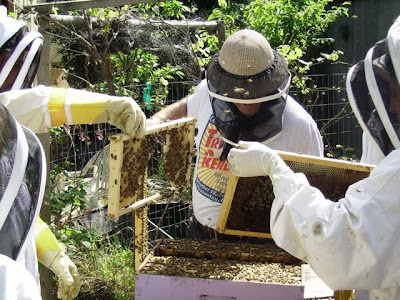 In my case, the yellow top short boxes are about 6 1/2" deep, and they're called supers (because they go above the deeps), and the extra stores of honey go in there. 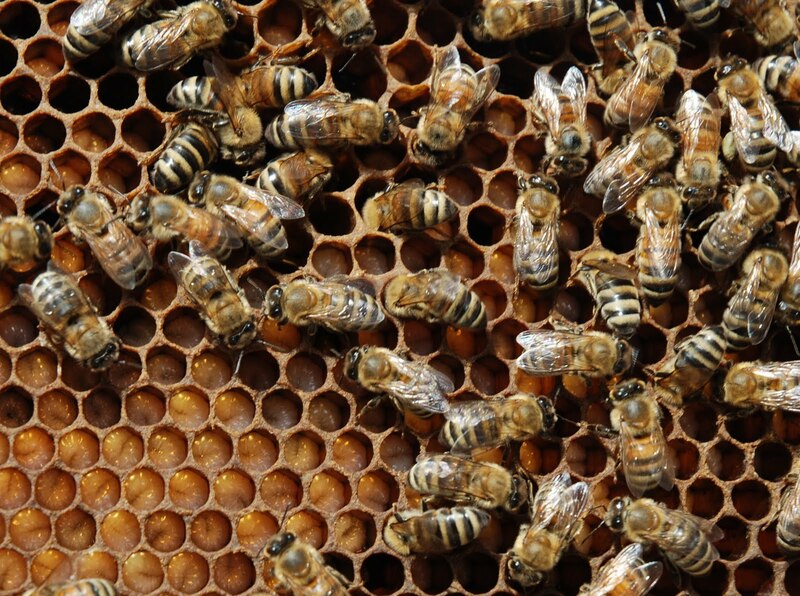 Some beekeepers put "queen excluders" between the deeps and supers, so that no babies can be laid in the top. I personally don't care, and if the hive is managed well, the bees keep their babies downstairs. Some keepers use only mediums, with three making up a large nest area, because they're just easier to lift than a full deep. Bees and honey are heavy. The boomer hive is still pretty great, even with the nonsense we'd perpetrated on it last week. Tomorrow is the day to see if our attempted queen rearing worked so far. So, enough anatomizing the bees, on to the rest of the parts of the garden. The new babies awaiting transplanting -- tomatoes, tomatillos, peppers, and a couple of cucumbers. The red kale is in full bolt, unfortunately. I was hoping to eat a lot more of that, and I'm not sure that it's going to taste good any more. The lacinato kale has decided to join the bolting club, before it even got big enough. I thought I was going to have to leave it in the bed, but now I think it's going to be dinner very very soon. Almost ready to plant, although the bees are giving me a bit of trouble when I'm out there, and Heiko, I'm going to plant potatoes AND tomatoes at the same time. Don't tell your neighbors. The bees must have gotten to the apricots, because they're about as big as a chicken's brain. Anyhow, I know I tend to throw everything into a post, but hopefully when I blather about bees it will make sense from now on. First, thank you to everyone who suggested catalogs. I think it's Baker Creek, but their online catalog doesn't show what I remembered. The Solomon book is here, patiently waiting for me to assemble ingredients. It's been a biggish week in the garden, and it feels like the time of year when there's more happening than I can keep up with. The fall planting of "True Siberian" kale was going to seed, so I went out with kitchen shears and lopped off all of the leaves. There are enough seeds left from last year that I didn't need any more, and the tomatoes want to come out and play. Almost ten pounds of nice greenness. I gave away five grocery bags full, and Sarafina and I ate a big bunch for lunch, with sweet sauteed onions, goat cheese, and toasted pine nuts. Amazing how so much cooks down to much less! On Thursday, a new beekeeping friend and his wife came over to see if we can't make some queens from my terrific hive. Another, sadly unphotographed friend, came and took pictures and got her beekeeping feet wet. I think we made another convert! So, for those of you to whom excruciatingly detailed beekeeping posts are lots of fun, let's go! First, we took off the honey supers, set up a spare deep hive box on top of the swarm hive, and split the two hive bodies on the bottom. We were looking for brood -- both open and closed. The next picture gives you a good idea of why we want to continue this queen's bloodline -- a beautiful frame of capped brood. She's laying in a great pattern, and that's what you want to see. The open cells are either brood the workers have cleaned out for some reason, randomness, or leftover stores or something. Hey, there's a LOT I don't know. This is probably open brood or honey stores. No capped cells here, and you can see the darker area where brood has hatched out in the past. Now you can see how we're set up -- honey supers on the junky old coop behind me, Alan telling me what he's seeing, Lisa waiting by the box we're isolating brood in, and the extra box on the second hive. We put all brood in the box on the ground, and all honey, nectar, and pollen stores in the unpainted box on the coop. The wire frame thingy is a queen excluder -- the idea is to isolate the queen in one box only. It would have been great to have seen her -- but queens move fast and mine aren't marked. Yet. So we're going to do the isolation by making the hive into three distinct zones, between which only workers can move. The bees grew more agitated the more we messed with them, of course. Eventually, we divided the hive into two bodies of brood plus stores. Into one of the brood bodies, we put the capped brood -- brood that is going to hatch first. The other one got any open brood -- eggs and visible larvae. That box should have the queen, but we're not sure, not having seen her. We also put an empty frame in the middle of each of the brood bodies, plus some pre-formed plastic frames. These aren't so fun for the bees, so the idea is that, in their cramped, messed-up state, they will draw fresh, soft, new comb on the empty wooden frame. There's a strip of wax along the top to encourage this. 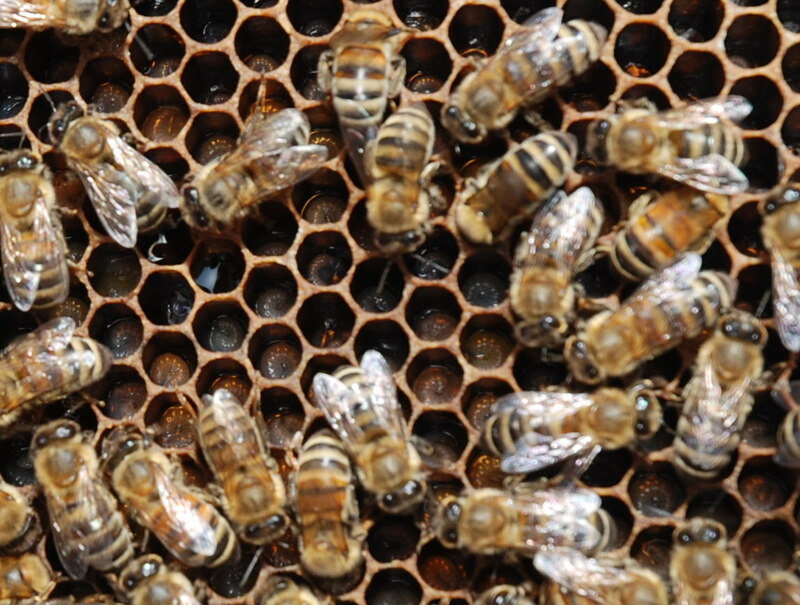 As they're avoiding the black plastic frames, the queen will lay in the fresh combs as soon as they're ready. Because they've never had larvae hatch in them and leave behind their pupae shells, like the old brood comb, the bees will more easily be able to alter these cells into queen cells when we make that happen next week. I'll tell you how we're going to signal to the bees to do that when we do it! By the time we got to "reassembly," we'd been at it for a while. Lots of unhappy bees, but I wasn't as wiped out as I usually am after a full hive inspection. I hadn't had to lift any heavy boxes alone, and there was a lot of good humor. We all took turns helping to identify whether we were seeing what we were thinking we were seeing. One box, with excluder, ready to be the bottom of the hive. Time to reassemble. I picked up the new bottom box, Alan picked up the old one with the screen board still stuck to it with propolis, and we counted, "One, two, three, go." Lisa prepared the old base to be the new base while we stood there and thought, "We should have done this part first." And after she placed it on the stand, we asked her to pry the old screen bottom off. Finally, and to all of our relief (including the bees, of course), it was time to reassemble the hive, with a queen excluder on top of each box of brood. Wherever the queen is, we'll find her by evidence next week. 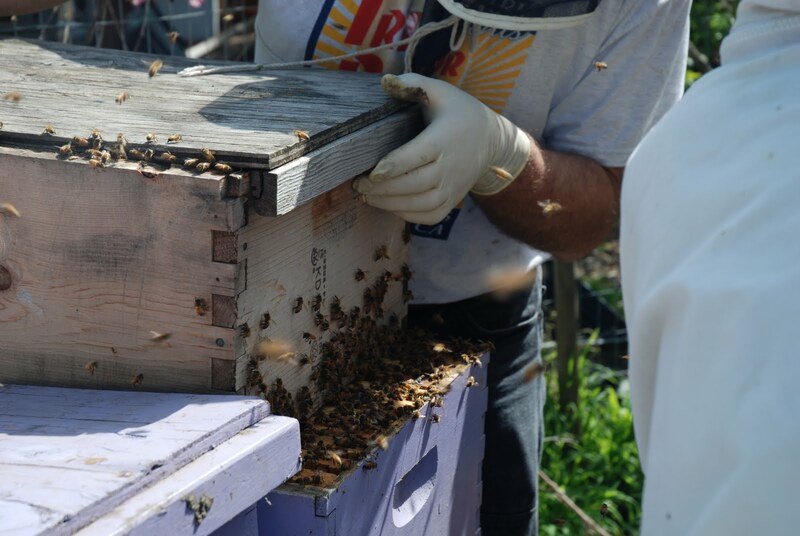 Then we'll put the new comb in that box, switching them to get eggs in both new frames. That third unpainted deep box was all the honey stores for the brood box, save that which we put back around the brood. It might be a nice full box of honey soon. Yay. We had to work to straighten out the hive -- with so much height, the tilt of the bottom was pronounced. Eeek. Finally we got it all cleaned up and repaired indoors for a cold drink. One thing that struck me afterwards was how many beekeeping pictures are actually pretty dull -- people in white suits holding frames of bees in front of their faces. Over and over and over. It's exciting to do, but the pictures? They get repetitive. You can click on it and see the same thing over and over again -- but bigger. So next week should be exciting, and we have some woodenware to prepare before then. I'm glad someone knows what they're doing!